Do you have wonderful plans for the weekend? We will be visiting friends with great food and conversation, a little crafting (I am sure) and just relaxing. I have been busy this week with DT projects, but finally got around to playing at Reverse Confetti (and none too soon, as this is the last day for their weekly challenge). 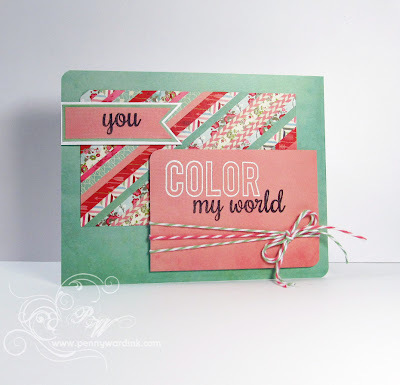 I absolutely love the Dream in Color stamp set...it is so versatile to change the sentiment to meet your crafting mood. I took Basic Grey's 6 x 6 pad True Love and cut strips from several of the papers, attached at angle to a piece of white card stock for the back panel. I love using this technique for left over scraps. This card is also entered into the Sketch challenge at Operation Write Home. Love it!! The color is awesome. Have a fun holiday!! Such a cute card! Thanks for linking up! 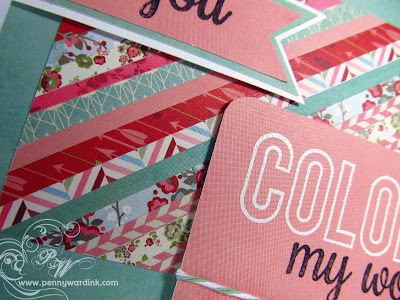 Sweet card - and the patterned paper...swoon! so glad to have *discovered* you; lots of creativity and inspiration on your site!! Love that striped background you created! Very nice card. Thanks so much for playing along with us over at the Simon Says Stamp Wednesday Challenge!